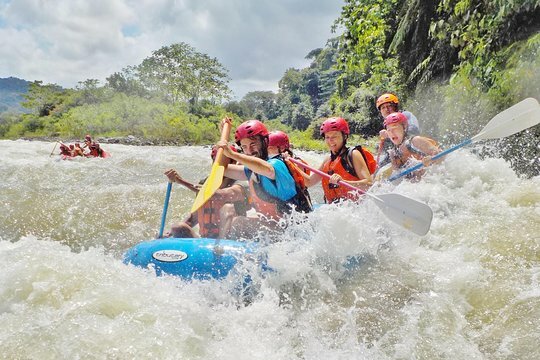 Shoot the rapids on Panama's Chiriqui Viejo River during this full-day tour from Boquete. 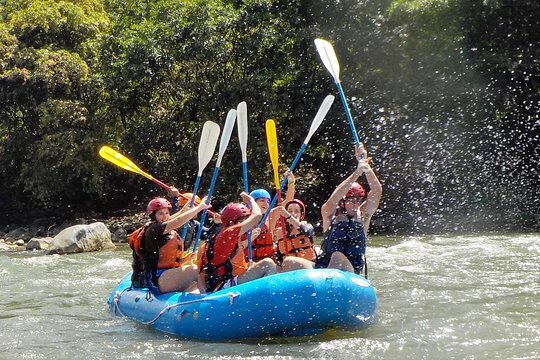 With an experienced guide to ensure your group's comfort and safety, ride a raft over Class III rapids, through the region's scenic landscape filled with endemic plants and animals. Suitable for all levels of experience, this tour includes use of helmet, life jacket, and water shoes. Picnic lunch and beverages provided. Enjoy a whitewater rafting day of adventure after meeting at the office at 8:15am to get properly prepared and briefed. Despite whether it is raining anywhere else in the country, the year-round sunny skies and lower elevation on the Chiriqui Viejo River allows you to maximize your sun time during your vacation. The comfortable air-conditioned transport vehicle will take you to the river where the guides will be waiting to suit you up in a life jacket, water shoes, helmet, and a paddle. 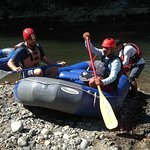 The brief safety demonstration will highlight proper paddling techniques, review guide commands such as "forward" "back" and "stop," and give tips of how best to stay in the raft. Wet suits are not needed for this tropical warm water river run. The journey through the jungle will start with some excellent high-volume first rapids to get the heart racing. The expert local guides' experience and steering techniques, as well as their sense of humor, will add to the excitement of the ride. Be prepared to see interesting wildlife such as squirrel monkeys, herons, kingfishers, and egrets around every bend of the river, as well as enjoy passing by local countryside farms with cattle, horses, farmers and cowboys. The day will pause around noon for a buffet lunch riverside when the guides will cut up fresh fruit and vegetables, as well as provide assemble-your-own sandwiches with the best local ingredients. All personal dietary restrictions can be easily accommodated. Once the fresh food has settled and break time is finished, you will load back into the rafts to continue the day's excitement. At approximately 2pm, after around 8.5 miles (14 km) the trip will finish up at the take-out with beers and sodas to celebrate with the guides. 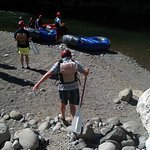 Take a group or raft team photo with your raft guide to take the memories home. Your vehicle will be waiting to return you to Boquete around 3:30pm. Don't forget to look up your free photos after the trip. Awesome day trip. Continuous fun on a mountain river in the jungle. Fun River, great guides, we saw a monkey and iguanas in the forest canopy! 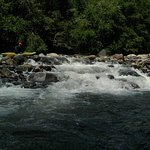 Get quick answers from Whitewater Rafting Class III on the Chiriqui Viejo River, Panama staff and past visitors.